More and more these days, the mid-priced acoustic guitar market is filled with absolute jewels. In addition to all-solid construction, onboard electronics and other higher-end features, there’s also a fair amount of innovation and experimentation to be found, from offerings in unusual finishes to the use of more exotic tonewoods and processes like thermo-aging. What’s more, acoustics in the sub-$1,000 range come in all shapes and sizes, from dreadnought to parlor to travel-sized mini guitars. In essence, it’s a category with seemingly limitless options. Here, Guitar World whittles the field down to 10 of the best. Part of Ibanez’s Artwood Vintage series, which borrows the best features from highly sought-after vintage instruments, the AVN11 features a Solid Caucasian Spruce top with a semi-gloss antique brown sunburst finish, mahogany back and sides, Thermo Aged Spruce X bracing, a mahogany satin finish, a “Soft-V” shape neck, an ovangkol bridge and a fretboard with gold mother of pearl dot inlays, in addition to cream binding with herringbone purfling, a bone nut and saddle and antique nickel finish tuners with oval knobs. True to its parlor shape, the AVN11 provides a full-bodied low-end and smooth sustain in the treble notes, which are common characteristics of vintage guitars. It feels great in the hands and has exceptional resonance, with a top that is Thermo Aged through torrefaction, making the tone wood lighter, harder and more stable. The process approximates the tonal characteristics of wood that has dried for decades and provides dynamic response and a louder sound. Overall, a very cool package. Fender’s California Series Player acoustics are impressive examples of just how much progress has recently been made in the sub-$500 market. In addition to playing and sounding excellent, the Players offer built-in pickup and preamp systems and original designs. The Newporter Player features a medium-size, rounded cutaway body with a solid spruce top and back, sides and neck crafted from mahogany and a walnut fingerboard and bridge. Scalloped x-bracing offers lively, dynamic tone and impressive volume output, and the built-in Fishman Classic Design pickup/preamp system provides bass, treble and volume controls plus a tuner. A generous cutaway makes it easy to play all the way up the neck, making the Newporter ideal for guitarists who like to play acoustic lead lines. What’s more, it looks extremely cool in all four of its gloss poly finish options—Candy Apple Red, Champagne, Jetty Black and Rustic Copper. The Washburn Woodline WLO12SE is an affordably-priced acoustic-electric based on the Martin OM body style. The model boasts a mahogany top and laminate mahogany back and sides, and its deep, rich color is augmented by rosewood binding, light pinstriping and a gloss finish. But the WLO12SE is more than just a looker: There’s a slim C profile neck (also mahogany) with a sleek satin feel, a 20-fret rosewood fingerboard and a NuBone string nut and saddle. Furthermore, the guitar comes loaded with a Fishman 301T preamp sporting volume, bass, treble and phase controls, plus a built-in tuner with an on/off button and LED display. 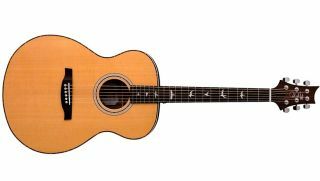 Both plugged in and natural, the guitar sounds punchy and powerful, with the reduced Sitka spruce bracing allowing the top to vibrate more freely, and adding clarity and cut to the more mellow mahogany tones. A unique twist on the standard acoustic, and worth every penny. You could call the new GS Mini a travel guitar, but that would be selling it way, um, short. A scaled-down version of Taylor’s GS (Grand Symphony)-shaped acoustic, the GS Mini loses 51mm off the scale length and just 86mm off the overall length of its big brother. Furthermore, there’s approximately 48mm less width and just 5mm less depth. The build quality, meanwhile, is exceptional. There’s a solid Sitka top along with Sapele back and sides, a Sapele neck (affixed to the body via Taylor's NT system) and a West African ebony fingerboard. There’s also some nice aesthetic touches, such as a three-ring rosette and three-layer purfling, which give the Mini the appearance of a more expensive, full-size instrument. Art & Lutherie may not be a brand that is on everyone’s radar, but for familiarity’s sake, the company is a division of the more well-known Godin Guitars. That doesn’t change the fact that, with the Roadhouse, you get what appears to be a boutique instrument at a more-than-budget price. For starters, there’s a solid spruce top and rich, crimson laminated wild cherry back and sides, covered with a pearloid pickguard, off-white binding and a semi-gloss finish that allows a bit of grain to show through—a nice touch. Coupled with the parlor-size body, the Roadhouse exudes a classic old-timey feel right out of the box. And it plays and sounds great to boot. The middle and upper ranges of the guitar are very strong, with plenty of clarity, definition and warmth. What’s more, the instrument rings out in a way that belies its small size, making it perfect to cut through the mix in an ensemble setup. The fretboard is clean and the strings are nicely spaced, making the Roadhouse a pleasure to pick. A perfect companion to playing some country, blues, or—why not?—some country blues. The Epiphone AJ-210CE boasts exceptional playability and performance. The spruce top is bold and bright, while the big body offers rich bass and bell-like treble tone with a clear midrange. The traditional western cutaway, meanwhile, allows easy access to the uppermost frets. The guitar has great construction, including a SlimTaper D-profile mahogany neck, back and sides, and a rosewood fretboard with pearloid dots. It also sounds great plugged-in, courtesy of the onboard Shadow Performer tuner/preamp, which sports a two-band EQ, built-in tuner, volume and phase controls and a low-battery indicator light. A NanoFlex under-saddle pickup ensures the AJ-210CE’s woody tones translate faithfully through your amp or PA. All-in-all, jumbo tone and appointments for a tiny price. PRS’ affordable SE series instruments perform well beyond the usual standards of other acoustics in their price range, delivering tone that’s comparable to the company's Private Stock acoustics. The SE Tonare T40E boasts a solid Sitka spruce top, ovangkol back and sides, a mahogany neck, ebony bridge and fretboard with “bird” inlays, plus a bone nut and saddles. Cosmetically, the guitar sports beautiful tiger acrylic purfling and rosette and cream body binding. The built-in Fishman GT1 electronics, meanwhile, are virtually “invisible,” with only a small block for the output jack, and battery compartment access mounted on the lower treble side and rotary volume and tone controls mounted above the low E string inside the soundhole. Soundwise, the T40E is an expressive, dynamic instrument with an outstanding bass-to-treble balance that’s powerful, sweet and rich thanks to its ingenious combination of X-bracing and classical fan-style bracing. Furthermore, the cathedral reverb-like resonance is stunning. A great fingerstyle for any price, in particular the sub-$1,000 range. The NTX700C might be a classical guitar, but with its narrower neck, radius’d fingerboard and 14 frets to the body, the instrument handles like a steel-string. Complementing its modern, hybridized design is a single cutaway and an oval soundhole which, in place of a traditional rosette, sports an artsy, red-triangle pattern design. The overall construction is sleek and spotless, with the guitar’s solid cedar top and nato back and sides outlined in black and white binding. There’s also a nato neck and rosewood fingerboard with side dot markers. Additionally, the NTX is outfitted with an A.R.T. 2-way pickup/preamplifier system, with a three-band EQ, tuner and master volume. The sound, meanwhile, is superb. The cedar top presents a slightly softer—but still full and present—tone than does spruce, and plugged-in, the guitar is warm and natural, absent any piezo “quack.” Whether you’re a nylon-string, steel-string or acoustic-electric aficionado, the NTX700 has something great to offer your playing. Martin was one of the first major manufacturers to offer low-cost instruments made from high-pressure laminates (HPL), and the DX1AE Macassar Burst is a stellar example of just how far Martin’s efforts with guitars built from alternative materials have come, both sonically and aesthetically. The DX1AE is a traditional dreadnought in the iconic acoustic guitar shape that Martin invented and perfected, and it is also equipped with built-in Fishman Sonitone electronics, so it sounds as good amplified as it does when played acoustically. While most of the guitar is made of alternative materials—including its high-pressure laminate back and sides, birch laminate neck and Richlite fingerboard and bridge—the top and braces are Sitka spruce. The DX1AE’s tone is as gorgeous as its looks. It delivers that classic Martin dreadnought “boom” with deep, commanding bass. The midrange is sweet, and the treble has a brilliant zing that really cuts through when strumming chords. Due to its non-scalloped X-bracing, the tone is not quite as complex, responsive and delicate as a more expensive Martin dreadnought, but the core and character of that unmistakable, beloved Martin dreadnought is still present in spades. The playability is outstanding as well, with a relatively low action that remains buzz free even when players vigorously strum chords. The SDM-15 is an all-mahogany Korean-built acoustic with onboard electronics that offers enough to satisfy the needs of blues, folk or bluegrass pickers. The guitar boasts dark-stained mahogany on the top, back, sides and neck, a striped rosewood headstock veneer and an ebony fingerboard and bridge. Offsetting the overall “brown-ness” of the body is a five-ply soundhole ring, silver frets, white bone nut and a saddle, mottled brown pickguard, chrome Grover tuners, a gold Sigma logo and, in a nice touch, 42-style abalone snowflake inlays on the fretboard. The SDM-15 exudes classic all-mahogany sound—earthy, rich and dark, albeit with less frequency range or tonal transparency than a rosewood or spruce model. For electrified tones, there’s a Fishman Sonitone under-saddle transducer and a built-in preamp, with controls that are intuitive and offer enough variation to suit any straightforward live situation. For an all-solid guitar with looks, electronics and quality construction in a budget package, you can’t go wrong here.